Anytime you have new messages, there will be notifications immediately appearing on the browser you are using. This is awesome, right? If you usually check for new mail everyday, everytime, you’d better use those add-ons introduced below. This will make your checking for new mail in Gmail much more convenient. Use add-on Google Mail Checker. Click here for setting. Click Free for setting, then a window will appear, require you to confirm if you want to set add-on. Click Add to agree to set add-on. After having installed add-on, you will see the symbol of Google Mail Checker (Gmail symbol) on the top right of Chrome or Coc Coc browser. You’ll receive notifications of new messages here. Use add-on Gmail™ Notifier Plus. Download here. Click Add to Firefox, then appears a window to confirm the setting, click on Setting now to start installing. After the installation have finished, you’ll see the Gmail™ Notifier Plus symbol on the top right corner of Firefox browser where you will receive notifications of new messages. This tip will help you log out of Gmail.com from any remote devices such as tablet PC, mobile phones. This is also a trick you should know in order to secure more Gmail accounts. That’s when you detect abnormal signs of logining your Gmail account (see how to check here), you can sign out of Gmail on all devices, then you should change your password and create a two-layer Gmail password (which are imprescriptible) for Gmail by using your phone number. Step 1: Sign in Gmail, pull down till the bottom of Gmail window, click on the line Details. 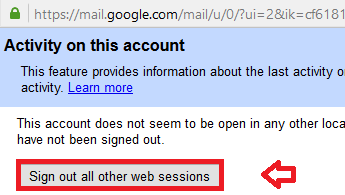 Step 2: Click “Sign out all other web sessions“. Step 3: Wait a minute, you’ll see the notification “Successfully signed out all other sessions“. Besides, you can also check the IP address and location where you log in as well as the time when you log in Gmail account. Wish you use Gmail more professionally!